In honor of the sun being out today, we present a classic sandal silhouette that makes the perfect all summer sandal, the Melissa Shoes Mar Flat Sandals. 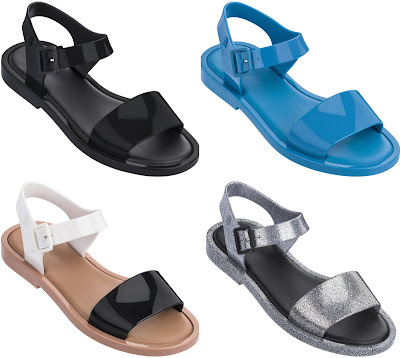 These classic sandals are anything but basic, and is super comfortable. After being a huge success in platform, heel, and wedge silhouettes, Melissa shoes decided to do a flat version, which we know will also be a hit. The Mar Flats boasts an ultra comfortable cushioning insole, is waterproof and vegan, as it's made of Melissa Shoes' proprietary recyclable PVC. Its minimalist design stands out in cool colors, like lavender, blue, black, black/white and sliver glitter. Get your favorite color(s) for only $85.00 from www.shopmelissa.com.